AMES, Iowa — Grain bins, a common sight for anyone traveling through Iowa and other corn belt states, are a source of concern for agriculture safety specialists. Lack of research means specialists are unable to provide consistent advice to farmers about working in the storage bins. The safety experts are “dropping the ball,” said LaMar Grafft, a rural health and safety specialist. Such an understanding would be important because farming has the highest fatality rate of any other occupation in Iowa, data from the Iowa Fatality Assessment and Control Evaluation shows. Between 2001 and 2011, 280 Iowa farmers died while working on farms. Of these deaths, 35 involved grain bins. Grafft works alongside William Field, professor of agriculture and biological engineering at Purdue University, to provide safety and emergency rescue training for confined spaces in agriculture, including grain bins and manure pits. 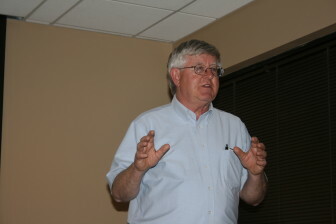 William Field, professor of agriculture and biological engineering at Purdue University, provided training during the Midwest Rural Agricultural Health and Safety Conference. Farmers entering grain bins face a number of risks, but traditionally “walking the grain” was an accepted practice among farmers who climbed in to see if grains had molded, Field said. “We have people saying, ‘Why are farmers in the bin?’ Well, because for 50 years we were telling famers to get in there and check on it, because there’s a lot of money in there,” he said. Field and Grafft presented a course called “Train the Trainer” during the Tuesday, Nov. 19, session of the 12th annual Midwest Rural Agricultural Safety and Health Conference in Ames. The conference, which attracted roughly 80 people, was hosted by Iowa’s Center for Agricultural Safety and Health, I-CASH. 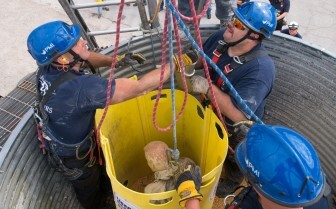 The course focused on training emergency rescue workers in grain bin safety and rescue. The goal is to have attendees go out in their communities and spread the information to other rescue workers and farmers. “When you have a group of volunteers roll up on the scene, are they going to be able to deal with this?” Field asked the group. The group included members of first responders in small Iowa communities. Tyler Mortvedt, chief for Slater Emergency Response Service, attended the course in order to learn about grain bin tube rescue devices, a portable tube roughly 5 feet tall that can be used when someone becomes entrapped in grain. The tube is pushed down through the grain around the person. Once it is down, grain inside the tube can be vacuumed out, setting the person free. Slater EMS has a rescue tube, Mortvedt said, but the problem is training. Some local EMS departments have been waiting six months for training, he said. Although he doesn’t know of anyone who has been trapped in grain in the Slater area his service covers in central Iowa, but wants to be prepared, just in case. “We’d rather prepare for it and have the tools available. The time when we do need it, we’re going to want it right there,” he said. In addition to improving training among responders, preplanning on the part of farmers also is valuable. “Preplanning can go a long way toward defusing a situation. If you have a 100-foot silo, bring the fire department out at some point to have them climb up so they know what it is like up there,” Grafft said. Despite the recent focus on grain bin safety, Field said people should be wary of overreacting about the dangers. Firefighters practice placing a rescue tube during grain bin rescue training at the Danville, Ill., Bunge facility on Tuesday, Sept. 17, 2013. “Somehow grain bins became the up and coming issue, when in reality the numbers (of fatalities) haven’t changed much,” he said. According to a Purdue database, there were 51 incidents nationwide in 2010, the highest year on record, he said. Grain bins have sprung up across the country as increasing numbers of farmers are storing grain on the farm, giving them more control over their product. Growing yields also mean existing grain bins are not sufficient to store the grain produced by America’s farmers. 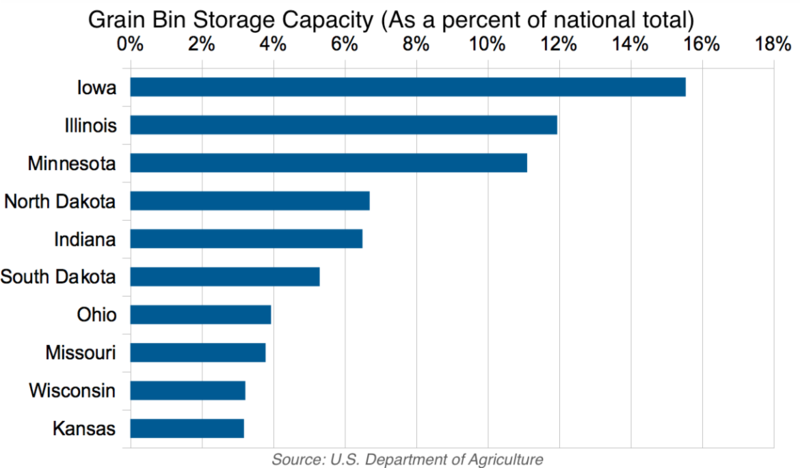 Iowa has the largest grain storage capacity of any state, according to the U.S. Department of Agriculture. One area where safety and monetary interests align is in improving the quality of storage bins. For example, farmers have to get into a bin to deal with grain that becomes molded or frozen together, increasing their risk of entrapment. But also, “if you keep the grain in good condition it’s worth more and is safer,” Field said. Grafft said understanding the slope of the stored grain, called the angle of repose, can help a farmer or rescuer decide whether it is safe to enter the grain bin. “If the angle is really steep, the grain is wetter and more dangerous,” he said. Grain bins are sold in a unique way — piece by piece — that prevents safety information from reaching farmers in the traditional way. One company might provide the galvanize steel, while a local contractor might pour the foundation and yet another company might provide the auger and set up gas lines, Field said. So, while buying a tractor or other farm implement often involves getting safety information and instruction directly from the dealer, grain bin safety information is not uniform. Some improvements have been made. 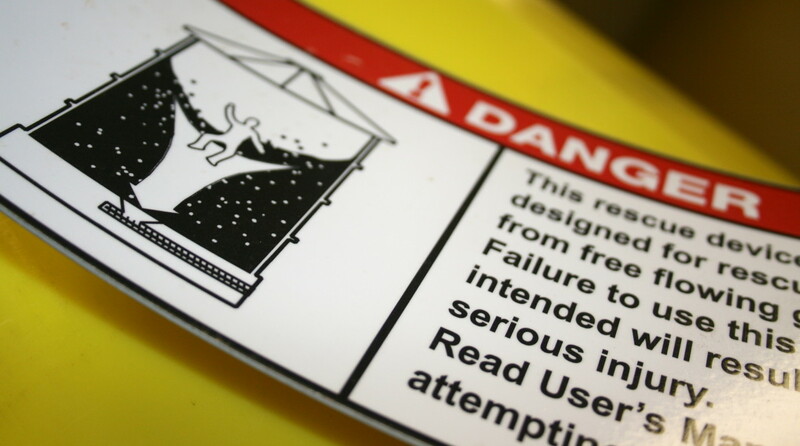 Manufacturers now voluntarily include large decals with safety information for grain bin doors. Changing standards in the way the bins are built could further increase farmer safety. Organizations, such as the American Society of Agriculture and Biological Engineers, are developing new and more effective standards for grain bins, Field said. The standards could include putting controls closer to entry doors and ladders, so that people can reach the controls quickly when incidents happen, Field said. Other concerns include beefing up ladders and widening doors, which he said are often only 24 inches wide.